Black Shouldered White Eyed Peafowl combine the pattern mutations of the Black Shouldered Peafowl and White Eyed peafowl. 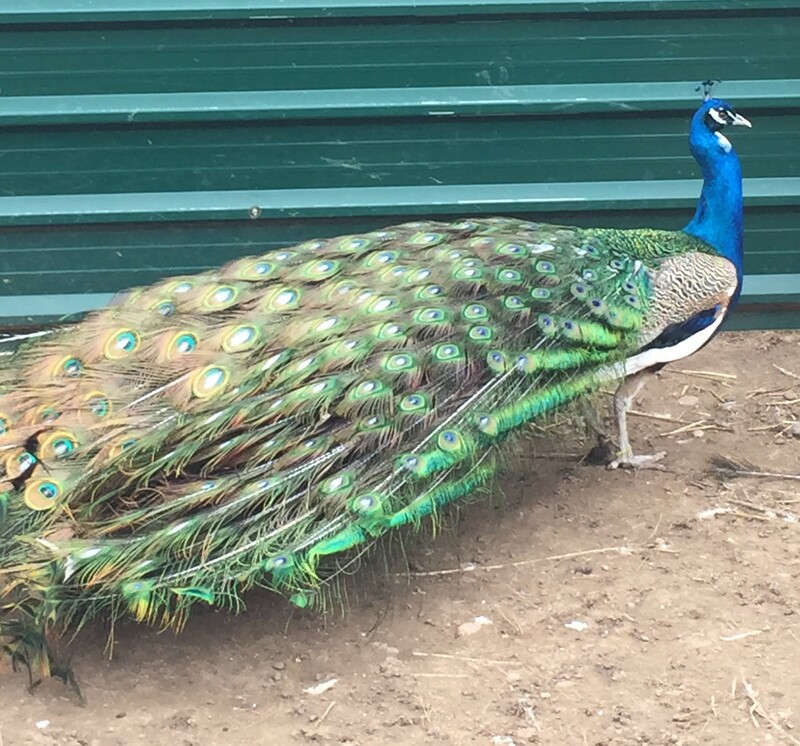 Black Shouldered White Eyed Peafowl were created by breeding White Eyed and Black Shouldered peafowl until the peafowl exhibited the physical traits of both breeds. Creating the Black Shouldered White Eyed Peafowl. 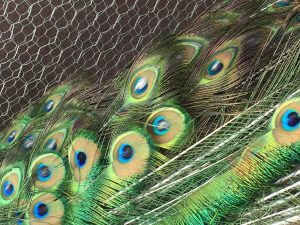 White eyed refers to the white in the centre of the peacocks tail not the seeing eyes of the peafowl. The mutation was discovered in the 1970’s and has since been crossed with most varieties. 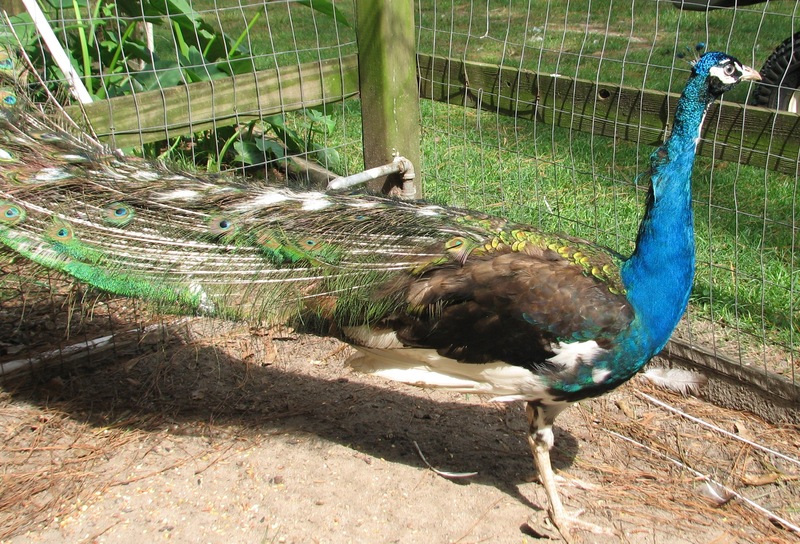 The males are similar to Black Shouldered Peacocks. However they have a white throat latch and white in the centre of their ocelli. Black Shouldered Peahens look similar to the Black Shouldered with white feathers sprinkled with grey and rusty and green metallic feathers around the back of their neck. When they hatch Black Shouldered White Eyed peachicks look identical to traditional Black Shouldered peachicks. When the Black Shouldered White Eyed Peachick hatch they have yellow down. Within a coupe of days buff coloured wing tips develop identifying the peachicks as Black Shouldered. The male black shouldered peachicks develop darker colouring and the blue neck colour as they age, and there are sometimes white feather tips underneath their wings. It is not possible to differentiate the female White Eyed Peachicks from traditional Black Shouldered peachicks. Consequently it is important to correctly mark the eggs and to tag the peachicks for identification purposes at hatching. This means that the Black Shouldered eggs and Black Shouldered White Eyed eggs must be separated from each other within the hatchery. Meanwhile as the Black shouldered White Eyed peacock reaches maturity the white eyes within the tail become more prominent. Often not all the eyes within the tail will have the white colouration. Sometimes the outside feathers will be normal colouration.